Mr. Bencke, the popular co-founder of Seattle startup Mighty AI and a former Microsoft manager, died in his Bellevue home late Wednesday night after his battle with cancer. In the weeks after learning he had stage 4 pancreatic cancer, Matt Bencke diligently put together photo albums for his two daughters with nearly a decade’s worth of pictures. He also worked with a videographer for nearly an hour each day, recording advice for them on college, careers and love, as well as stories of his life. 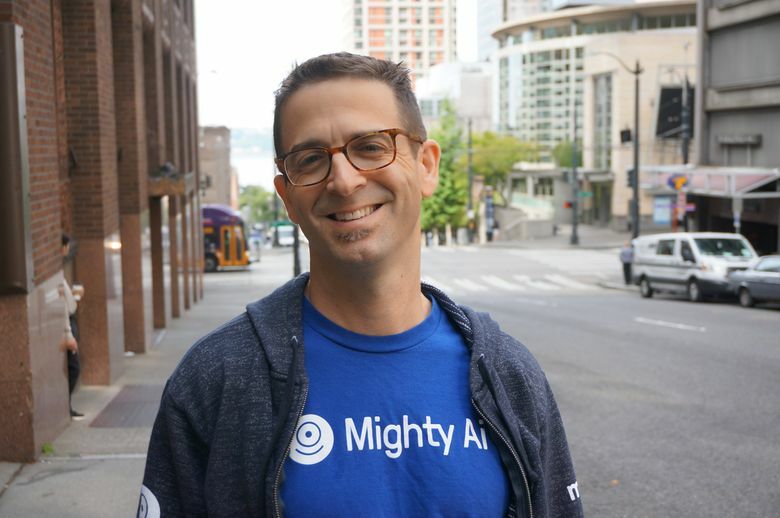 Mr. Bencke, the popular co-founder of Seattle startup Mighty AI and a former Microsoft manager, died at his Bellevue home late Wednesday night from cancer. He was 45. Since then, a public Facebook group with updates on his condition brought together nearly 900 members, many of them taking time to share stories and photos of Mr. Bencke on the site. His friends remember him as someone who always genuinely cared about everyone he interacted with. Mr. Bencke most recently served as CEO of Mighty AI, a startup that helps companies improve their artificial-intelligence technology. Before that, he worked as a senior vice president at Getty Images and on the Xbox and Windows teams at Microsoft. He also spent more than eight years at Boeing as a director of business and global strategy. Mezulis met her husband 20 years ago this week on a blind date that turned out to be not so blind. The two realized they had gone to Harvard University together. Mezulis remembers feeling immediately drawn to Mr. Bencke’s “wicked smart” and passionate personality. They married less than three years later. Their careers took them from the Bay Area to Madison, Wisconsin, to Seattle, and a love of travel took them even further — to Russia, France and southern Africa. After his diagnosis, Mezulis asked her husband what some of his favorite trips were. To her surprise, he included a vacation the two took to Paris and the south of France in the late 1990s. The pair had gotten in a fight, about something long forgotten, which had ended with one of them stomping across a small town square. When Hadi Partovi, CEO of Seattle’s Code.org, met Mr. Bencke the first week of their freshman year at Harvard University, he didn’t yet know the technology leader that Mr. Bencke would become. Instead, he had heard of Mr. Bencke’s claim to fame as the student who, as a summer intern, had discovered the farthest galaxy known to man at the time. Mr. Bencke started out studying astronomy, Partovi said, then changed his mind and learned to speak Russian while he studied international relations. Mr. Bencke went on to earn a Ph.D. in political science before pursuing careers that would eventually lead to his role as a tech startup leader. At work, Mr. Bencke took care to make sure the employees of Mighty AI felt valued and welcomed, Partovi said. He started a practice in the company’s early days where new employees would share information about their families and hobbies at weekly all-staff meetings, a practice that continued even as the company expanded past 50 people, the Mighty AI team said on its blog Thursday. They referred to him as Coach Taylor from “Friday Night Lights,” someone who could always bring the team together. “He would push people hard, but he would always be the one that was working the hardest,” Gottesman said. Fellow Mighty AI co-founder Daryn Nakhuda will continue to lead Mighty AI, after stepping in as interim CEO shortly after Mr. Bencke’s diagnosis in July. Even as he worked long hours at his job, Mezulis said, he was always present and deeply involved in his family’s life. He made pancakes for his daughters every Saturday morning (extra eggs, no dairy). He would take his daughters out to dinner, each individually, to have one-on-one time. He was so focused on whatever he was concentrating on at any given time, Mezulis said, that he always made people feel cherished and special. Besides his wife, Mr. Bencke is survived by daughters Anna, 15, and Elsie, 12. Mr. Bencke’s rock band, Element 47, is playing a concert at 6:30 p.m. on Oct. 23 at The Crocodile as a fundraiser for the Pancreatic Cancer Action Network. A memorial service for Mr. Bencke will be at 1 p.m. Nov. 9 at Bellevue Presbyterian Church.